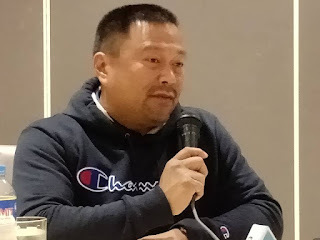 NAGA CITY (Bicol Standard) – Re-electionist Senator JV Ejercito urged Bicolanos to join him in pressuring the government to expedite railway modernization, especially of the South Line of the Philippine National Railways. In a press conference on Feb. 1 at Villa Caceres, this city, Ejercito underscored the relevance of a modern railway system to the economic growth of the country. “I understand how important this is to Bicolanos,” he stressed. He said he is currently the only one pushing for the railway system’s revival, which began when he was still a member of the House of Representatives, representing San Juan, Manila. He narrated that the contract with the Project Management Consultant (PMC) was already signed in Nov. 2018. The PMC is responsible for preparing the designs, will assist in the bidding, and perform construction supervision. From Dec. 2018 to June 2019, the PMC is scheduled to prepare designs. Procurement of contractors will start in July 2019, concluding with the contract signing in Dec. 2019. Meantime, land acquisition, resettlement of informal settler families (ISF), and utilities relocation will happen simultaneously with the design preparation, from April 2019 onwards. At present, the country is lagging at least 15 to 20 years behind in terms of infrastructure development, which includes the mass transport system, Ejercito explained. “I believe there is no other way than the railway system that we could address the traffic congresion in Manila and other key urban cities,” he noted. “The railway system could serve as the backbone of our economy. It will create growth nodes and spread out development across the countryside,” he said. “Only an efficient, reliable, cost-effective, environment-friendly, and modern railway system which moves people and goods faster can be the catalyst for economic growth,” he concluded.